About being a teenager and having a job (2007): "It's really strange, trying to fit into both places. At school, I'm supposed to be a kid; and filming, I'm supposed to be an adult. I'm a teenager - I'm meant to be carefree and irresponsible and rebellious - but I have a quite serious job. Sometimes it's hard to deal with." 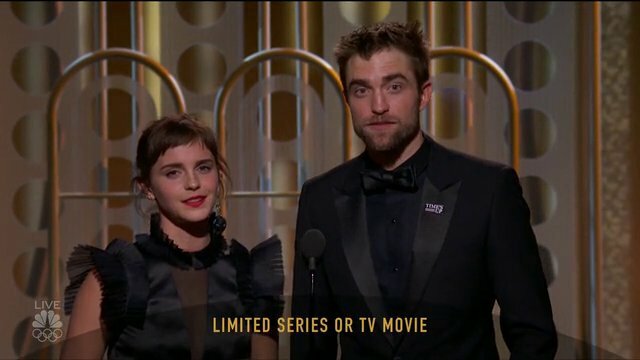 Emma Watson and Robert Pattinson presented the award for “Limited Series or TV Movie” at the Golden Globes. I’m going to assume that originally there was supposed to be a bit of the usual banter between them, but with the show running late this was cut. Well. posted by dook on Monday, January 8th, 2018, filed under Awards. Emma looks so beautiful in black dress.